The Village of Lions Bay recognizes and supports community groups through funding and in-kind services. These community-based organizations are volunteer based and provide local residents with programming, recreation, and special event opportunities that are local, affordable, inclusive and of interest to members of the community. The Lions Bay Arts Council (Society) was formed out of the belief that the culture of our community is enhanced by our resident artists, their endeavours and our enjoyment and support of them. The LBAC Society continues to work hard to reach out to all Villagers who love, work, support and believe in the Arts as an enriching and essential component of our Lions Bay community life. Join now for your lifetime membership. As a community member, you will have a voice in the programs and projects that will be supported through the Arts Council. The LBSSC is one of several "circles" or social groups that contribute to well-being within the community in various different ways. In 2015, a grant from the Union of BC Municipalities (UBCM) to the Council spearheaded a "Seniors Social Circle" program. The program that came about was the result of community consultation. It consisted of fitness programs, speaker events, and outings, generally within socially interactive settings. The LBSSC plans to continue and hopefully expand what it did in 2015, and to cooperate with other community groups. The Lions Bay Historical Society was founded in 1995 to reflect the rich and invigorating history that the village has established recently and throughout the previous decades. Tony Cox, current chairman of the Lions Bay Historical Society, highlights how the organization has benefited the community positively. The opening of the Centennial Trail, which connects the communities of Kelvin Grove, Lions Bay, and Brunswick Beach, was just one event that the organization was involved in, creating brass plaques at each end of the trail to commemorate and remember the official linkages of the Village together. The Lions Bay Historical Society also held a flag contest for the village, which Victor Miles won. 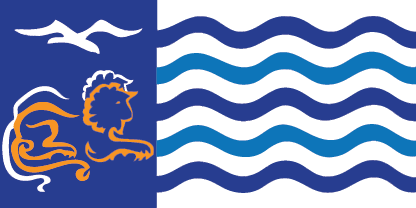 The flag consists of blue lines and white stripes conveying ocean waves, the lion representing the two iconic mountains above the village, and the seagull, a popular bird in the area.